The Bristol Bay Borough Libraries consist of a main and branch library, serving three communities King Salmon, Naknek, and South Naknek, Alaska. Each Library serves as a main hub of informational resources within its community. These libraries not only help bridge economic divides, but also provide a place for its users to promote their personal growth, education, literacy, recreation, life skills, attend programs, develop job skills and career advancement, cultural and artistic development, and recognize diversity. Visitors to the Borough Libraries’ will find a wide-range of collection of books, magazines, and audio/visual materials for all ages. Both libraries have a small children’s room, a shared commons area along with the circulation desk, four computer stations and an area for seating. The library services consist of photocopying, computer-prints, faxes, inter-library loans, Wi-Fi access and Internet computer stations. Some fees apply for certain services. The Wi-Fi and in-house internet computer use is free to all users. Both libraries current internet speed is 6M Down/2M Up with up to 100 Gigabytes/month usage. The staff strives to offer the best possible services for its users; considering the area of rural limitations. During the peak seasons of May, June, July and part of August the Wi-Fi and in-house computer stations may be subject to certain internet limitations due to space and the demand for internet and seating. Library users are encouraged to call the library to learn about other possible services the public library may be able to provide. Hours vary between the two libraries; please refer to the schedules below. Please note: hours can be subject to change. 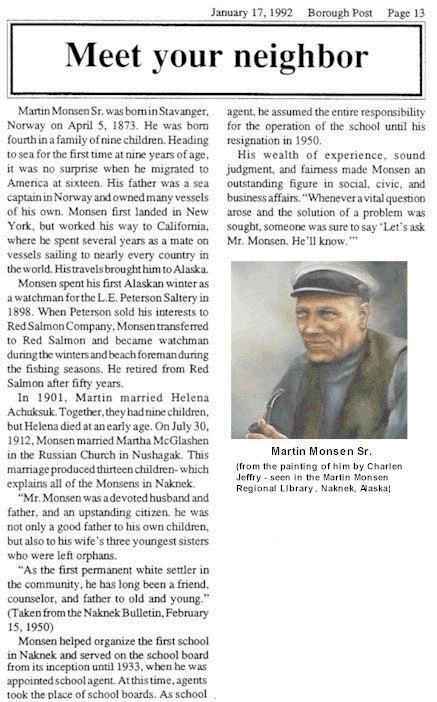 Martin Monsen Regional Library is located in Naknek, AK. The Branch Library is located in South Naknek, AK.